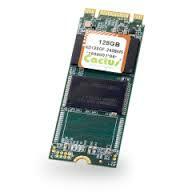 acon Industrial M.2 2260 SSD is a new SSD module designed for embedded systems applied for industrial platforms. acon industrial 2260 SSD offers a universal temperature range for operation, 0°C - 70°C and -40°C - 85°C and a capacity up to 256GB. OEM Grade pSLC M.2 have >6 times more endurance cycles than Commercial Grade products based on MLC NAND. Pseudo-SLC products should be used in applications which require better endurance, error rates and data retention than the Commercial Grade MLC SATA III SSD.